The federal election campaign in 2011 was the least successful to date for United Russia, which saw its reputation tainted by accusations of vote-rigging and fraud. How is Russia's ruling party preparing for the upcoming elections in 2016 and can it repair its tarnished image among voters? Russia’s ruling party United Russia – the party with the highest voter rating in Russia – is heading toward the upcoming parliamentary elections against the backdrop of a downward economic trend for the first time. The elections will be held in September 2016, but the party leadership is already concerned about the outcome. United Russia still controls a majority in the State Duma and regional parliaments, but the last elections to the State Duma in 2011 found the party at a critical juncture. Allegations of fraud, street protests following the announcement of results and the popular slogan describing United Russia as “the party of crooks and thieves," successfully promoted by the opposition, have hurt its reputation. On Friday, Feb. 5, United Russia opened a party congress dedicated to the forthcoming elections. The main idea proclaimed at the congress was national solidarity. 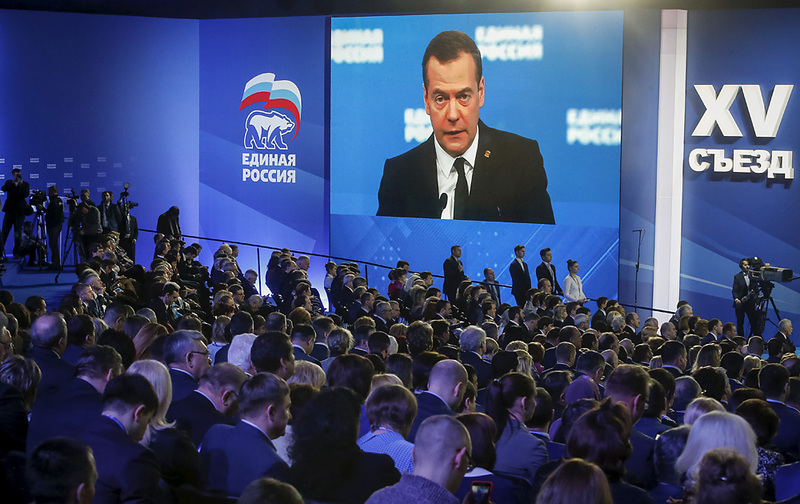 The country regained its strength not at a time when all was well with the economy, "but when we were in agreement," the party's chairman, Russian Prime Minister Dmitry Medvedev, said in his speech. The image that United Russia created for itself and that later let the party down in the protest years of 2011 and 2012, by when it was already seen by many as inseparable from the Kremlin, was formed over a number of years. Having emerged in 2001 from the merger of two political movements, Unity and Fatherland – All Russia, the United Russia was largely the party of regional elites. The electoral bloc Unity was created in 1999 under the banner of supporting then-Prime Minister Vladimir Putin and brought together a large number of regional heavyweights. According to experts, the brand "United Russia" was to bring the positions of different regional elite groups closer to the policy of the federal center. At the same time, it did not imply unity in ideology. "Historically, there are several ideological currents within the party [United Russia]. The party has patriotic (conservative) and social (center-left) platforms, it is something like internal party factions," said Alexander Pozhalov, director of research of the Kremlin-linked Institute of Social and Economic and Political Studies, in an interview with RBTH. Given the extreme weakness of liberal parties in Russia over the past 15 years, United Russia also appealed to the center-right wing of Russian politics. "This is the part of the middle class, which emerged in the 2000s and considers itself supporters of the president," explained Pozhalov. In this sense, United Russia is hardly a typical party with a single ideological line. According to Dmitry Orlov, head of the Agency for Political and Economic Communications, it could be compared to the Liberal Democratic Party of Japan or the CDU/CSU party in Germany. The fact that the vast majority of United Russia's lists in the regions were headed by governors or regional ministers over the years has meant that many have labeled it the party of bureaucrats, executives and officials – a tag that did it no favors when suspicions of electoral irregularities later sprang up. However, the key to its success – its closeness to Russian President Vladimir Putin (who is no longer related to it legally after distancing himself from it in the wake of the 2011-2012 protests), and its administrative resources – means it has serious advantages over its rivals. In 2007, Putin led the federal list for parliamentary elections and United Russia won a record high to date of 64.3 percent and 315 of 450 seats. However, it was its access to administrative resources and accusations of abusing them that resulted in the situation when, during the controversial 2011 parliamentary campaign, United Russia (and by extension, the government, since the party wielded a two-thirds constitutional majority) was accused of vote-rigging, resulting in large-scale demonstrations in Moscow and other Russian cities. The protest vote ("Vote for any party but United Russia") allowed the Communists and other representatives of the parliamentary opposition to gain a substantial percentage. But protest voting should not be expected during the 2016 campaign. First, the current Duma opposition has been characterized by a large number of prohibitive initiatives put forward by deputies – the Communists, for example, have proposed banning organizations that help young Russians to find word abroad, and introducing exit visas for Russian citizens. As a result, the difference between United Russia and its formal opponents has worn off altogether in the minds of many voters, and studies record people saying "It's all the same party of power," said Yevgeny Minchenko, director of the Moscow-based International Institute for Political Expertise. Secondly, none of the parliamentary opposition is, in reality, seeking to obtain a majority; they act in their electoral niches. "In Russia today, there is a so-called one-and-a-half party system," said Orlov. "There is the main ruling party, and the public support rating of the rest is below the ruling party." And the point of their political struggle is not in obtaining a majority, but in expanding their niche. "Relatively speaking, Pepsi-Cola cannot defeat Coca-Cola. Having 20 percent of the market, it can win another 1 percent at best," said Orlov. This is not to say that the parliament is fully devoid of opposition sentiment. The Communist Party, for example, has never voted for the budget. "The budget determines the essence of the policy that will be carried out over the coming year. And the refusal to vote for it is the main criterion of the opposition in any political system," said Orlov. It is unlikely that United Russia will resort to large-scale rigging in 2016; the result is important, but not crucial for the Kremlin during this campaign. "What is essential is to preserve the current configuration: so that the parties which are within the patriotic consensus win the elections," said Yevgeny Minchenko. In this respect, the open primaries (the preliminary selection of party candidates with ordinary voters) at the federal level that United Russia is to hold for the first time are a demonstration of openness instead of the backroom agreements that characterized former practice. The Feb. 5 United Russia congress also resulted in the decision being taken to replace almost a third of the members of the party’s supreme council. This is an attempt to replace the party's "heavyweights" with opinion shapers (doctors, actors, authors and philanthropists), which will effectively “reset” the ruling elite. "This is a constructive process in United Russia's evolution," said Alexander Pozhalov of the Institute of Social and Economic and Political Studies. "This will relieve it of its current image of the bureaucracy's party." The popularity rating of United Russia is a reflection of the electorate’s confidence in the president, but Vladimir Putin is yet to see the current socio-economic situation affect his own popularity, with 82 percent of Russians declaring themselves satisfied with Putin’s performance as president in a poll conducted on Jan. 24. "But you can take your irritation out on the ruling party," said Yekaterina Shulman, associate professor of the Institute of Social Sciences at the Russian Presidential Academy of National Economy and Public Administration. "And these are risks for the electoral campaign." In this situation, the Kremlin needs independent or self-nominated candidates who will be supported by the All-Russia People's Front (a non-partisan public organization established by Putin in 2011); they are not associated with the ruling party, but are considered sufficiently loyal to form the necessary pro-government majority upon being elected to the State Duma. At the same time, the party’s current rating is around 50 percent and, according to Dmitry Orlov, United Russia as a result has a chance to increase its representation in the Duma.